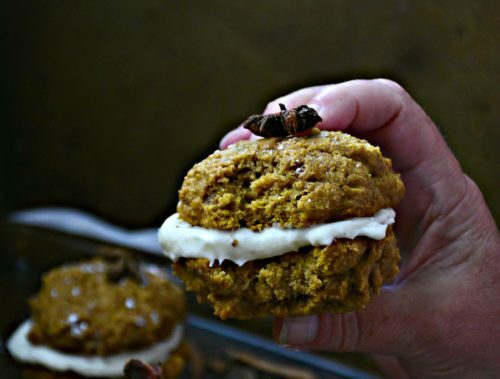 Y’all, it’s pumpkin whoopie pie season and I’m not even mad about it. 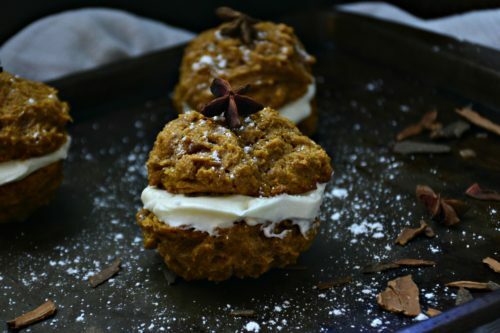 Actually, pumpkin whoopie pie season started two months ago but I was in Croatia eating truffles so…I know, my life. 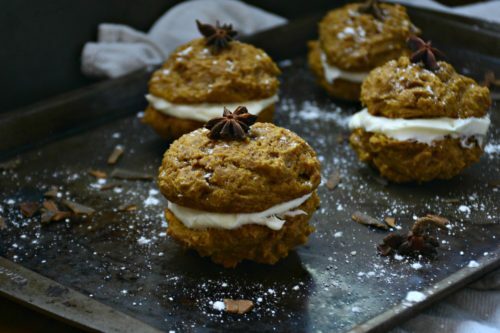 However, now that I’m home for the entire month of November, I’m catching up on all the things i’ve missed – like pumpkin desserts. And cream cheese frosting. And cookies. And cake. And pie. Good thing I chose TODAY to go Paleo, right? WRONG. All I want to do is eat these cookies, thankfully I made them weeks ago and there’s not even a morsel left to remember. Because I’m weak and I’d probably eat 4 in a row and then force myself to go to Orange Theory again tonight out of shamerage. It’s a thing, google it. My mom, the ultimate cookie baker, said these are one of the best things i’ve made all year, and after taking a big bite (for photo purposes, obvi), I had to agree. They’re most definitely one of the fluffiest, sweetest and most decadent cookies I’ve made to date. The thing with whoopies is they’re almost always left off the desert table because they’re not the most attractive. Unlike thumprints or pinwheels, which are radiant and beautiful, whoopies aren’t the most festive. However, that’s no reason not to indulge in these cakey little bites this holiday season. Add some styling, like I did. Serve them with some fresh star of anise or roll them in crushed walnuts or even edible glitter to give them a pop of color. I’m all about the accessorizing, even in food. 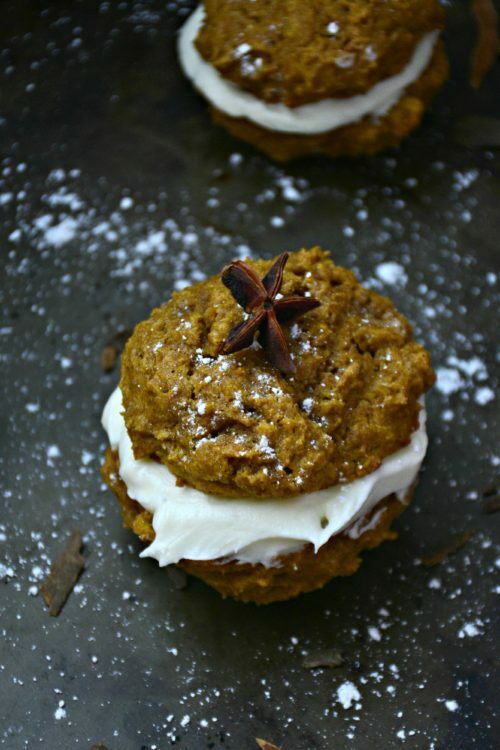 Do yourself a favor, make these for Thanksgiving. Whether you style them or not, they’ll be the biggest hit on your pie table. You might have to seperate them from the apple because nobody is going to touch that pie after trying these. And we all know how jealous apple gets. Beyond whoopies, I’m basically just sitting on pins and needles because we’re still patiently (cough not really) waiting for the offer to get accepted on the most beautiful two-bedroom condo in all of Chicago. But, I’ve been pinning all of the rain showers and claw-foot tubs, subway tiles and vintage sinks in the world to get ready for it. See, the place is actually in AMAZING condition, but the main bathroom needs to be gutted. 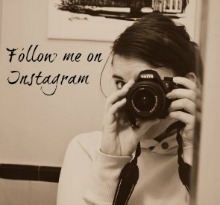 Completely. 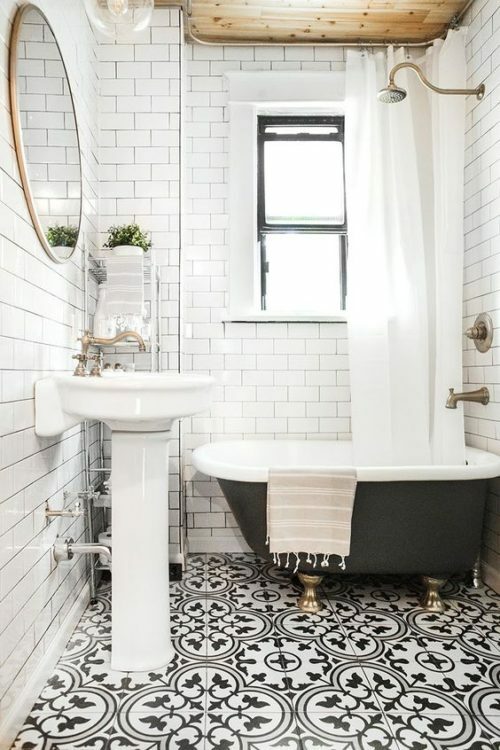 So, we’re going to install a rain shower (insert heart eye emoji here), subway tile, a vintage sink and some cute industrial lighting fixtures to bring it all together. I’ve never had a place that needed a reno like this, so I’m beyond excited for the potential possiblity. If we get it, of course. So please, cross all of your appendages. It’s in such a fantastic part of the city and is within walking distance to great cafes, an OrangeTheory, Whole Foods and everything in between. And, you know, it would help me get out of my parents house. Because at nearly 32, it just isn’t cute anymore. Yields about 10 medium – large sandwiches. Preheat oven to 350 degrees F. Line a cookie sheet with parchment paper and spray with nonstick cooking spray. In a mixing bowl, whisk the whole wheat flour, all purpose flour, baking powder, baking soda, pumpkin pie spice and salt together. In another bowl, mix the brown sugar, canola oil, applesauce, pumpkin puree, egg and vanilla. Once mixed, add in the flour mixture a cup at a time and stir until fully combined. Using a spoon, scoop the dough onto the sheet. The cookies will spread a little, so place them about 1 1/2 – 2 inches apart. If you want the tops to be smooth, use a piping bag or smooth them out with your hand. I left them as is and kind of dig the almost oatmeal like texture. Bake for about 12 – 16 minutes, or until they spring back at the touch. Place on a wire cooling rack and let cool. Meanwhile, beat the cream cheese, butter, powdered sugar and cinnamon together until thick and creamy. Once the cookies have cooled, add a large dollop of frosting on the top of half of them and place another cookie on top to make a sandwich. Dust with powdered sugar and enjoy!